After initial data upload has been completed, sometimes you need to convert it into another format or represent it in some other form. TeamDesk allows you to perform such modifications on the fly. 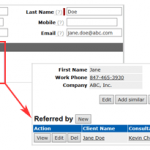 Thus, data from the Name column is duplicated and divided into 2 additional fields – First Name and Last Name. When two new columns are ready, check if views and reports represent data correctly and in the way you need. Change type of the First Name and Last Name columns into regular text column. At this step all data taken from the original Name column are recorded into the newly created columns. What is the most amazing about these manipulations, is that all objects, tables and elements that ever had any references to the original Name column, keep operating without any errors or data losses.